If you can tolerate milk sugars, dairy can be a small part of your diet. If you are trying to lose weight, too much cheese can derail your efforts. Milk is produced by a mammals mammory glands, and is the primary way that baby mammals get their nutrients. Milk is a rich soure of calcium, and promotes strong bones and teeth. Milk contains many vitamins such as vitamin K, strontium, magnesium, vitamin D and vitamin C. It is also a very rich source of protein. 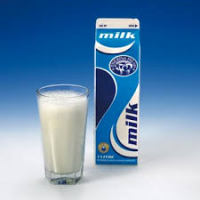 If you are watching your fat intake, opt for skim-milk or low-fat milk instead of whole milk. Buttermilk is the slightly sour liquid that is left after butter has been churned. Nowadays, buttermilk can also be the process of reintroducing lactic-acid bacteria to pasteurized milk. It is a rich source of potassium, vitamin B12, riboflavin, phosphorus and calcium. Buttermilk is high in protein and carbs and low in fat. It also combats acidity, reduces high blood pressure, and aids in digestion. Buttermilk is probiotic, and can be used in a variety of baked goods or drunk on its own. When milk is left to stand alone, the thick fatty liquid that forms on top is known as cream. Use cream sparingly, as it is very high in saturated fat. Heavy cream has about 400 calories and 28g of saturated fat per cup, while light cream has 350 calories and 23g of saturated fat per cup. Cream is richer than milk and can be used in coffee, certain recipes, and made into whipped cream. Using cream in your coffee makes you feel full longer, stabilzes your blood sugar and boosts your brain power. Condensed milk is milk in which the liquid has been removed. Condensed milk is thick, and usually found in sweetened form. 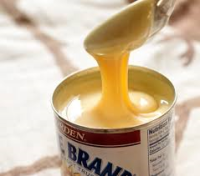 Condensed milk can be used in many different recipes, or boiled in a pot of water to make caramel. Condensed milk should be used in moderation, as it is very high in sugar and calories, with 62 calories for only a tablespoon. One tablespoon also contains about 2g of fat, so opt for low-fat or fat-free condensed milk if you are watching your fat intake. The added sugar in this milk product can cause inflammation in your body. Evaporated milk is condensed milks unsweetened counterpart. It's made simply by removing 60% of the water from regular milk. Evaporated milk contains nutrients such as protein, calcium, vitamins A and D. Because canned milk is condensed, it is higher in calories and fat because the nutrients are concentrated into a smaller amount. Use evaporated milk in moderation to avoid consuming too much fat. Butter is made from churning cream, and it is usually used as a spread or in cooking. Butter is high in saturated fat and low in protein and carbs, which makes it a food that you want to use in moderation if you are watching your fat intake. Butter is rich in CLA, Vitamins E, D and K, and lecithin. Butter can be used in many dishes, in baked goods, and as a spread on toast. Grassfed butters, like KerryGold, are one of the healthiest fats you can eat. Ghee is a clarified butter that is popular in India. It is made from simmering butter and then removing the liquid residue, leaving a solid. It has a golden color and a slightly nutty flavor. Ghee is great for people with casein and lactose sensitivies, and it contains vitamins A, D and E as well as butyrate. Ghee can aid digestion and reduce inflammation. It is also rich in CLA and K2. Ghee can be used in place of butter in any meal. Cheese is a great source of calcium and protein. It also contains vitamins A, B12, riboflavin, zinc and phosphorus. Cheese can be a great addition to a meal in moderation. Low fat cheese has some of the milk fats removed. If you are following a low fat diet, opt for these. If you are not watching your fat, a rich, decadent serving of a soft cheese like brie or goat cheese will keep you satified. Whichever you choose, try pairing it with a healthy option, such as lean protein and vegetables. Hard cheeses are aged, and they come in many different varieties. They are harder and drier than soft cheeses. Do your best to opt for part-skim or low-fat cheeses if you are following a low fat diet, because they are lower in fat but still contain the same amount of other nutrients, such as calcium and protein. Cheese is best in moderation, so be conscious of your portions to avoid eating too much saturated fat. Hard cheeses tend to have a stronger flavor, so a little goes a long way. 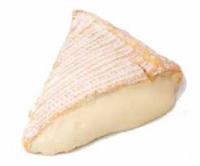 Soft cheese is made from raw milk. There are many different cheeses that fall under the "soft cheese" category. Since soft cheese is spreadable, it can be easy to overdo it. Be conscious of how much soft cheese you use, because it can be very high in fat. Even those doing a keto type diet need to be careful, as the high fat continet can stall weightloss. Soft cheeses can be healthier than hard cheeses because they tend to have a lower sodium content and less calories per serving. Ricotta is an italian whey cheese. It is made from either sheep, cow, goat, or water buffalo milk whey that has been left over from the production of cheese. Ricotta has a slighty sweet taste and a creamy texture. Eating Ricotta actually contributes to your daily protein needs. Ricotta also contains calcium, selenium, vitamins A and B-12. You can use it in tomato based meals, add it to eggs, use it in cheesecake or any number of desserts. Cottage cheese is made from the curds of slightly soured milk. Cottage cheese is a protein rich food that makes a great bedtime snack because it contains Casein, a slow-releasing protein that can aid in muscle recovery overnight. Cottage cheese is low in sugar, and high in protein, at around 25 grams per cup. Cottage cheese can be enjoyed paired with fruit, whole wheat toast, on its own, or used in many different dishes. Cream cheese is a soft, fresh, spreadable cheese that is made from unskimmed milk and cream. It is high in fat and calories. You can reduce your caloric intake by opting for fat-free cream cheese. You also get around 10% of your daily calcium needs from cream cheeese. Laughing Cow cheese is a great healthier alternative to regular cream cheese. Yogurt is prepared from milk fermented by added bacteria. Yogurt is a great breakfast choice, paired with granola and fruit. If you are watching your sugar intake, read your labels and be aware of yogurt with high amount of sugar. This is usually found in flavors with fruit in them. Go for plain greek yogurt, which is a good source of protein with half the carbs and sodium of regular varieties. Greek yogurt can be substituted for other fats in baked goods, and added to smoothies and shakes. Greek yogurt also makes a great replacement for sour cream in dishes and dips. Look for the words "live and active cultures" on the container, which means your yogurt contains probiotics. Sour cream is regular cream that has been fermented by certain types of lactic acid bacteria. Sour cream is high in calories and high in saturated fat, and low in carbs. It can be a source of milk protein and has a small amount of vitamins. If you follow a low fat diet, regular sour cream should be used sparingly. Shoot for reduced-fat or fat-free sour cream in dished whenever possible to reduce the amount of calories and fat, or choose to replace it with plain greek yogurt, a healthier alternative. Ice cream is obviously a guilty pleasure for all of us. Try to eat ice cream in moderation, or as a weekly treat, as the sugar content in most name brands can be very high. If you're looking for an ice-cream that leaves you satisfied without the guilt, try brands such as Halo Top and Arctic Zero. The best part is that they contain whey protein, and are low in sugar. These brands can be eaten every day, guilt-free!